Texas Gov. Greg Abbott has tapped John Sharp, the chancellor of Texas A&M University, to lead the rebuilding effort in the wake of Hurricane Harvey. Sharp will chair the newly-formed Governor's Commission to Rebuild Texas, Abbott announced Thursday, giving Sharp a "simple charge" during a news conference at the state Capitol. "Rebuild Texas ahead of schedule, under budget and with a friendly smile of constant consumer service," Abbott said. Abbott has tasked the commission with marshaling state resources to help Harvey-struck communities assess their needs and advocate for them at the state and federal levels. In addition to Sharp, the commission is expected to draw on the expertise of the state's top emergency management officials, who were arrayed behind Abbott at the news conference. In selecting Sharp to lead the commission, Abbott said he was looking for someone who knows how to work with officials at all levels, has a "natural, intuitive feel" for the people in the affected communities, and possesses deep knowledge of the budget as well as state agencies. 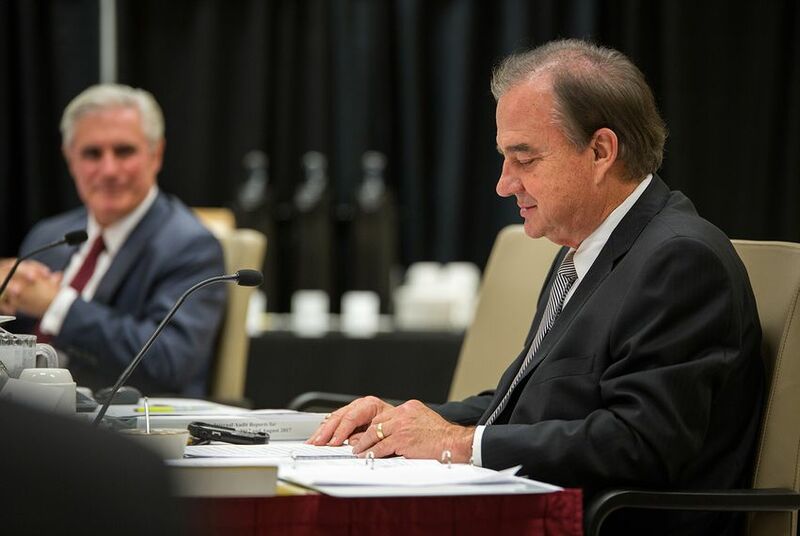 Sharp has served as chancellor of the A&M system since 2011. He was a longtime Democratic elected official in the 1980s and '90s, serving as the comptroller, in both houses of the state Legislature and on the Railroad Commission. When he served in the state Senate in the 1980s, Sharp's Victoria-based district included communities that were hardest hit by Harvey when it made landfall last month as a Category 4 hurricane. At the news conference, Sharp said he knows "well the charms and challenges of living on the Gulf Coast." "The road to recovery is going to be long, but Texans are a tough breed," Sharp said. "We will rebuild Texas and we will build it even better than it was before." Sharp is not expected to have to leave his job at A&M for the new position. Abbott was scheduled to visit Corpus Christi and Richmond later today to meet with local officials about the Harvey recovery. Sharp was set to join him on the trip.